On a cold winter day, there’s nothing more soothing than treating yourself to a bowl of steamy hot soup. While we were stuck inside our apartment, watching the snow cast an enchanting white blanket over New York City, we decided to brew up some delicious soup to warm our tummies. In the process, I discovered a new favorite ingredient to work with – Celery Root. Don’t be scared by its rough exterior. 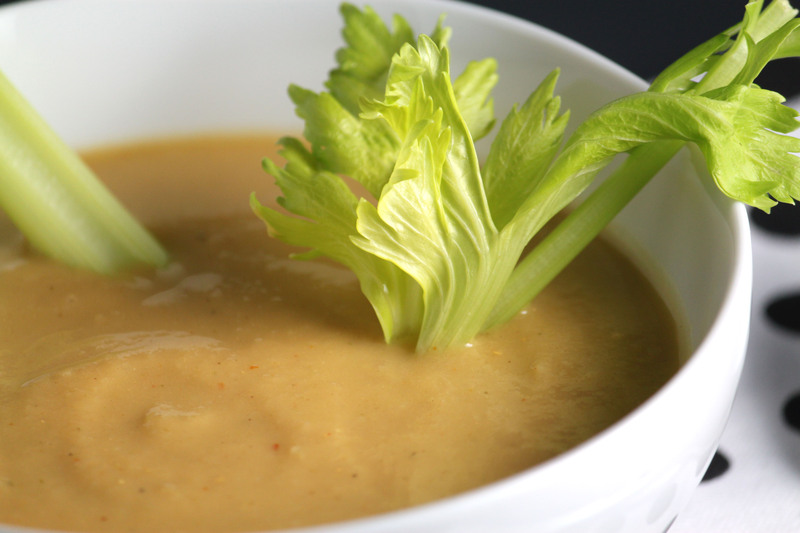 Though it may look a bit like a veggie monster, it packs a punch of flavor – savory, creamy, with a bit of unexpected peppery bite. 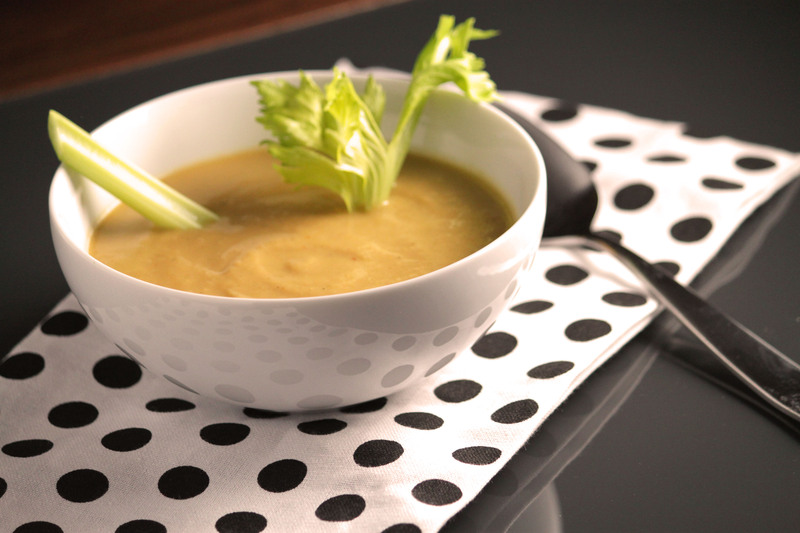 Paired with a few celery stalks, it makes for the perfect cure for cabin fever! Trim off the lumpy and knobbly skin of the celery root and chop into 1 inch cubes. Melt 1 pat of butter in a frying pan and cook the onions until translucent and soft. Add the celery and cook for 3-4 more minutes. Add more oil if necessary. Meanwhile, in a pot, bring 1 cup of broth to a boil. Add the celery root and let it continue to boil for 5-7 minutes. Add in the onion & celery into the pot and pour in the remaining 3 cups of broth. Finally, add in some salt & pepper to taste, and drop in the bay leaf and thyme. Bring to a boil, and then bring back to low-medium heat and let simmer for another 15 minutes. Remove the bay leaf. 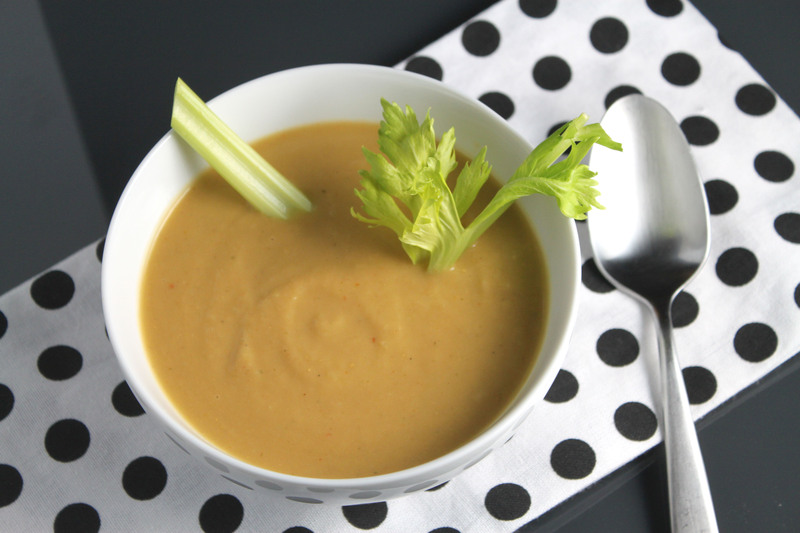 In batches, puree the soup in a blender or food processor until smooth.